This man believes that Eclipse is Jesus's work. He said, he's a professor. On Monday, August 21, more than 20,000 spectators gathered at Sanford Stadium on the University of Georgia campus for a "Blackout Eclipse Watch Party." (You can see some photos here.) When the eclipse was over and everyone was trying to make their way through throngs of people towards open areas, some encountered unexpected scenes. There were some individuals, like this person, who were preaching the gospel to the students. This person in the picture believed that Jesus made the eclipse. 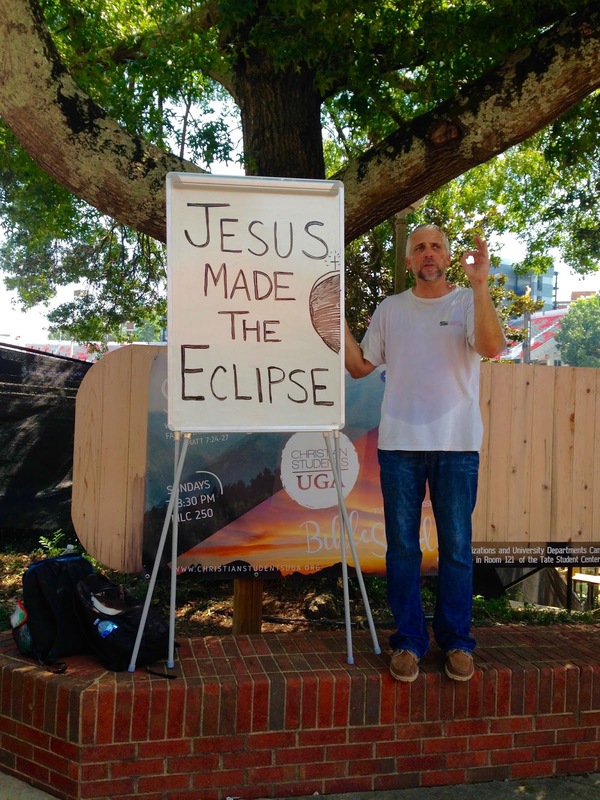 I approached him and made a tongue-in-cheek comment: "Hey, saying such thing that Jesus made the eclipse on a university campus is insulting to human intelligence," in which he answered: "Oh you are insulting me, sir!" He was obviously serious, but I was not. I left. Some students stopped by and took selfie while joking and laughing. This man reminded me of my father. Just a reminder for those of you who visit this blog for the first time and read this post, I was born in a far-flung village in central highlands of Afghanistan known Hazarajat. Every time there was a solar or lunar eclipse, my father used to tell us that it is the work of God. He used to ask us to read the Qur'an, (I used to joke with my brother that how terrifying verses of the Qur'an would be to stop God from what he likes to do) loud enough that can be heard across the planet. He himself used to weep while standing upright in front our house or sometimes on the roof for supplication. He was sad and made us sad, but we were sad because our dad was sad, not because of lunar eclipse. We had no idea what that was. Our sadness also had another element. When my father was sad, he would get irritable and difficult. We had avoid engaging with him in any sort of conversation. He would become unpredictable and that was not good. So, when the eclipse was happening, one could read from my father's face that the world was ending and we had to be careful not to contribute to it. Yes, I grew up with such myths, that God does such and such and if you do wrong you go to hell and if you do right, you go to heaven. My father is an illiterate peasant. He can't read and can't write. But when I encounter someone blaming the eclipse on human sin and says he's a professor, I feel hopeless and sad, not for the society, but for that individual person who still lives in the dark.